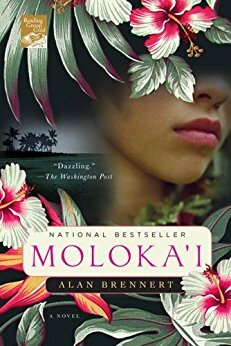 Barb Roark will lead a discussion of Alan Brennert's historical fiction novel Moloka'i. Participants are encouraged (but not required) to read the book in advance. Ask for a copy at the library’s information desk. Compellingly original in its conceit, Brennert's sweeping novel tracks the grim struggle of a Hawaiian woman who contracts leprosy as a child in Honolulu during the 1890s and is deported to the island of Moloka'i, where she grows to adulthood at the quarantined settlement of Kalaupapa. Rachel Kalama is the plucky, seven-year-old heroine whose family is devastated when first her uncle Pono and then she develop leprous sores and are quarantined with the disease. While Rachel's symptoms remain mild during her youth, she watches others her age dying from the disease in near total isolation from family and friends. Rachel finds happiness when she meets Kenji Utagawa, a fellow leprosy victim whose illness brings shame on his Japanese family. After a tender courtship, Rachel and Kenji marry and have a daughter, but the birth of their healthy baby brings as much grief as joy, when they must give her up for adoption to prevent infection. The couple cope with the loss of their daughter and settle into a productive working life until Kenji tries to stop a quarantined U.S. soldier from beating up his girlfriend and is tragically killed in the subsequent fight. The poignant concluding chapters portray Rachel's final years after sulfa drugs are discovered as a cure, leaving her free to abandon Moloka'i and seek out her family and daughter. Brennert's compassion makes Rachel a memorable character, and his smooth storytelling vividly brings early 20th-century Hawaii to life. Leprosy may seem a macabre subject, but Brennert transforms the material into a touching, lovely account of a woman's journey as she rises above the limitations of a devastating illness.